The dreaded word NO. What's in this two letter word that people find it hard to say. The word NO is the hardest word that a person can say because this word is connected to fear of rejection, fear of being labeled as selfish and fear of creating conflict. Do you oftentimes hear your self apologizing again and again even if there is nothing to apologize with? Take this instance, you are to meet your friend for lunch, but you arrived 10 minutes late. You are embarrassed that your friend has to wait for 10 minutes for you so you apologized and say " I'm late because I was caught in traffic". That's all right because your friend deserves an explanation why you're tardy for the lunch date but if you keep on apologizing the whole time you're eating then there is something wrong with that. It is not a simple regret of being late for your lunch date but this is more of fear of not pleasing your friend, fear of being rejected, fear of feeling selfish because you didn't arrive earlier than scheduled. It's the same with not being able to say NO but saying YES instead. You are a people pleaser, you want to be agreeable to anything that they say so as not to have a conflict with them. Why is this so? The answer is you are afraid of rejection. You are afraid to hurt their feelings. You are afraid to disappoint them. You are afraid that they will think you're selfish. But wait, how about, what you are feeling? When somebody, asks for anything from us, most of the time our answer is YES. We want to be agreeable because we don't want to create conflict and it is in our nature to want to be likeable by everybody. This stems from the fear of rejection. We cannot stand being rejected, whether this is verbalized or not. In our mind, we don't want others to think less of us. Thus, it is easier for us to be agreeable to anything other people say even though we resent it or we are not comfortable with it. How then can we say NO? If you want to say NO, plain and simple say NO. Don't coat it with other words like maybe. Be firm about it but not rude. Say NO and explain your reason/s for saying NO with no frills. If you are not comfortable with what is being said to you then you should say NO. How many times replying with a firm NO can protect you from abuse. If somebody is hurting you physically say NO by walking away from that person, from the relationship or from the situation. Many of us have lived with the lie that we should live our lives according to the approval of other people. That is not true. We are our own person, nobody owns us. Nobody can dictate to us what to do, what to think, what to say. We are in full control of our life and answerable to our own actions. Your self worth is not dependent on how much or what you can give to others. If we continue to live dictated by the approval of other people, we can never be free. We will be forever shackled to the dictates of the society. Nobody is perfect and if we commit mistakes because of our actions and decisions then we will rise above it and learn from it. That is what living our life is all about. 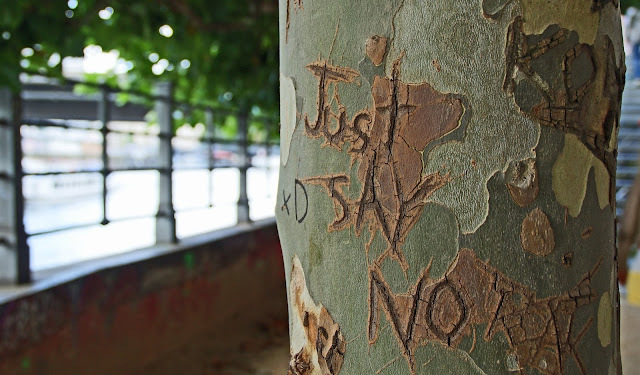 Saying NO may make you unpopular with the majority but you should bear in mind that it is better to say NO now than feeling regretful afterward. When we say NO to something you don't want to do or agree on, the other party may not understand you now and may feel resentful towards you but if he is a man/woman of reason, then later, on they will understand you and respect you for what you believe in or stand for. A NO is not acceptable especially if it will cost you your happiness. As a member of the Midlife women society, we too are pressured to say YES all the time. YES, that at midlife all goes downhill from here. This is farthest from the truth, in fact at midlife, we become more self-confident because we had gone through all good and bad times and we come to realize there is more life to live. YES, that at midlife, we lead mediocre lives. Another myth, at midlife, this is the best time of our life to reinvent our self and fulfill our long lost dream that has to take a backseat because of economic or personal reasons. It is the right time to learn new skills or resurrect older passions. If you don't do it now, it would be too late. So for us, midlife women, say NO to the wrong beliefs tied to the midlife stage. NO to the myths that prevent us from moving forward and living the best time of our life.